Started in 1992, Common Grounds Coffee was the first official coffee house in Lexington, KY. This company has grown into the largest locally own coffee business in Lexington KY. They roast their own beans in their local warehouse. This warehouse facility also serves as their commercial kitchen and coffee supplier in which they provide freshly roasted beans to other Kentucky owned coffee shops. The proprietors have also partnered with Willet Distillery to craft their own bourbon barrel coffee. 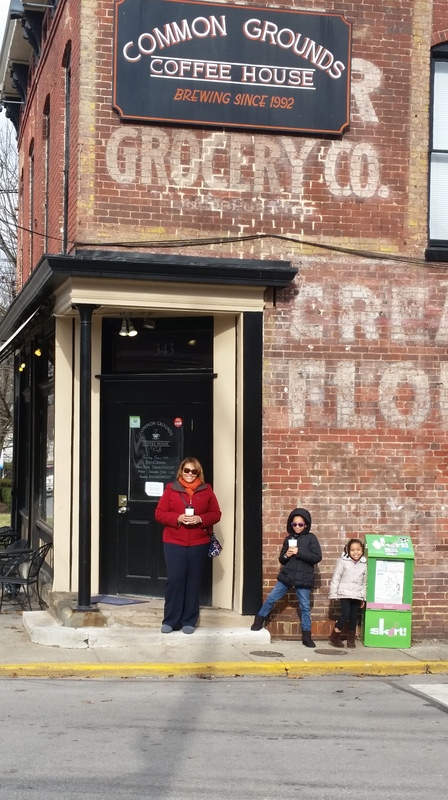 My family and I had an opportunity to visit “The Original” site; located at 343 East High Street Lexington Kentucky 40507. The décor is reminiscent of their appreciation for the Music and Arts. They have Open Mic Night and display the work of local artist on their walls. There is also plenty of nice seating and is a good meeting place for those who just want to hang out and connect with friends. My husband and I enjoyed a few of their specialty lattes. He had The Buckeye: a creamy blend of peanut butter and chocolate. It was simply delish. I had the Depth Charge: a very rich drink with 4 shots of espresso, caramel, chocolate & vanilla. I requested this drink to be lightly sweet. It had a very unique and lovely taste. Full of body and flavor. This drink is for an experienced palate for sure! No newbies here!!! Overall, the Baristas and other staff were very professional and took time to explain the menu. We also shared a slice of Triple Chocolate Cake. Yummo! Categories: Uncategorized | Tags: barista, bourbon, breve latte, coffee, esspresso, java, latte, Lexington KY, Willet Distillery | Permalink. A devoted wife and dedicated mother of three. I enjoy cooking, baking and perfecting my personally developed recipes. Professionally, I am a Master Level Healthcare Administrator who promotes quality healthcare services. My mission is to ensure proper treatment for the "under-served" in our community. I have a passion for coffee and the experience it brings. When traveling, I seek out coffee houses that are off the beaten path, eclectic in nature, unique and present a serious love for the beans! DISCLAIMER: This is a personal website/blog, produced in my own time and solely reflecting my personal opinions. Statements on this site do not represent the views or policies of my employers, past or present, or any other organization with which I may be affiliated. All content are written and edited by me.